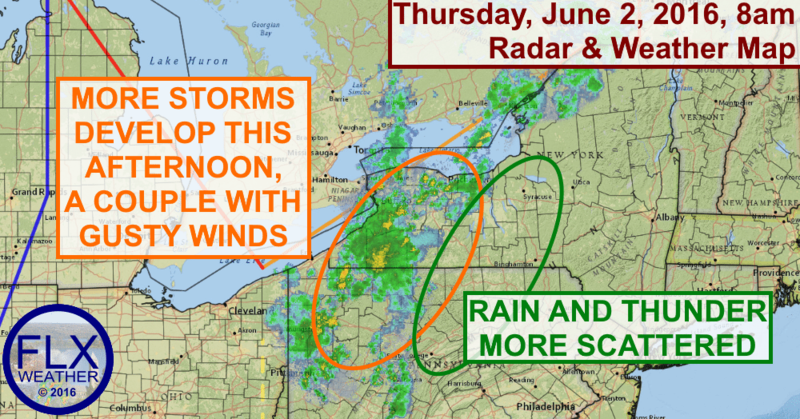 Thunderstorms, some strong, are likely across the Finger Lakes this afternoon. A batch of rain and embedded thunder is moving into the western Finger Lakes this morning. This precipitation is lifting to the northeast, so areas further west will see more rain than areas to the east. This precipitation should clear out by the midday hours and some sun may even show. Additional thunderstorms will then develop this afternoon, especially across the western Finger Lakes. A few of these storms could become strong with gusty winds the primary threat. Further east, thunderstorms will again be more scattered. Precipitation will become more likely in these areas this evening and overnight in the form of scattered showers. A few of these showers may even linger into Friday morning. Temperatures today will climb to near 80 degrees this afternoon, though some areas may not have time to warm quite that much between rounds of precipitation. It will be a bit breezy as well, with some non-thunderstorm gusts over 25 mph. Friday will be quieter, as clouds transition to sun during the day. Temperatures should be in the upper 70s. Saturday will be sunny and mild, with highs near 80 degrees. The humidity will be low though. Sunday is a very interesting day. Low pressure will approach from the west during the day. As it does, a warm front will move through during the morning with rain and thunder, followed by a cold front later in the day. Winds above the surface will be favorable for severe thunderstorms, but only if there is enough sun and heating during the early afternoon to fuel late day storms. The severe threat Sunday may very well not become clear until Sunday itself, so stay tuned. Behind Sunday’s front, the weather turns cold and showery as the low pressure system stalls to our north. Highs next week will mostly be in the 60s.